I do. So do most people. Maybe that's part of why I love the "Tracked" column in WSJ Magazine. Every issue, they follow a top achiever around for a day and tote up all they got done -- 73 phone calls, 14 meetings, 30 laps swum, etc. I thought it would be fun to analyze a handful of "Tracked" profiles for you, in search of common traits -- each of which you can copy in your business. Want to know what I found? If you can find more shared habits among these 5 super achievers, let me know in the comments section below. 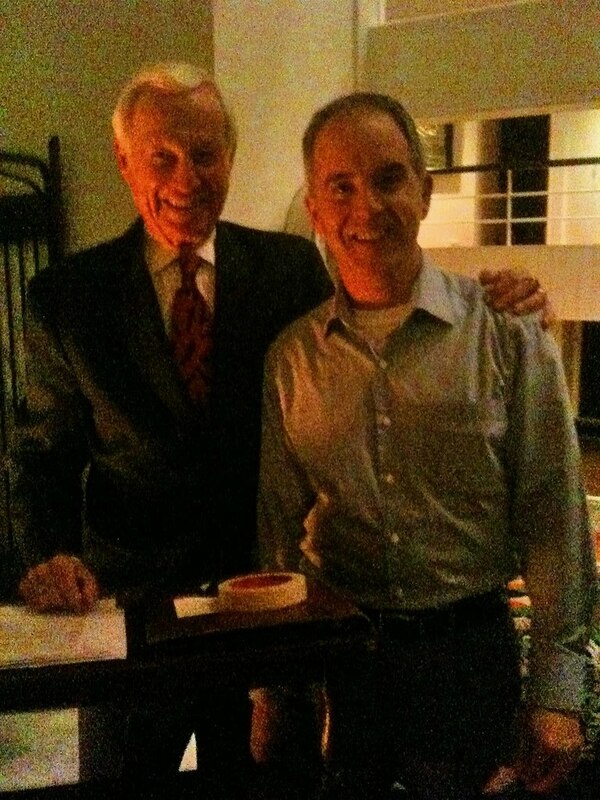 I had dinner with Harvey Mackay at his home last night, along with a group of folks helping promote his new book, The Mackay MBA of Selling in the Real World. He shared dozens of anecdotes about business and life, many of which you'll find in his books. In 1988, after publication of Swim With The Sharks Without Being Eaten Alive, Harvey found himself in the same New York ad agency as Larry King. Each was there to shoot publicity photos. Harvey wanted to ask Larry King to book him as a guest on his TV show, but missed his chance. Quickly, the shoot was over and Larry headed out the door to his limo. Harvey, dejected, walked out to hail a cab. Suddenly, the window rolled down on Larry King's limo -- "Where ya headed?" "The Carlyle Hotel," replied Harvey. Taking his seat, Harvey remembered a lesson his father had drilled into him as a kid: "When you shake someone's hand for the first time, ask yourself: 'How can I help this person?'" 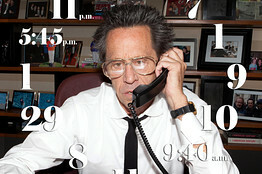 While engaged in small talk, Harvey's mind raced: "How can I help Larry King?" Nearing the hotel and running out of time, Harvey had an idea. "Larry, do you want to sell more books?" "That's why I write 'em!" he said. "Well, I've made quite a study of the publishing industry in the last year and I may be able to help you," said Harvey. Just then, the limo pulled up at The Carlyle, but Larry told his chauffeur to turn off the engine and wait. "Go ahead!" he said. About 15 minutes and 7 ideas later, Harvey had given Larry plenty of help. And Harvey had an invitation to appear on Larry's TV show. Harvey's first appearance on "Larry King Live" sold 50,000 copies of Swim With The Sharks, and led to a spot on Oprah ... that sold another 50,000. The rest is publishing history. So, next time you're talking to someone who can help you, resist the urge to brag about yourself or kiss up to them. Instead, ask yourself: "How can I help this person?" Then let the answers guide your conversation -- you may be very happy where it ends. Email is your public to-do list that anybody can get on. I don't know who came up with that idea (it wasn't me) but I’m happy to share it with you. Anyone who knows your email address has a button they can push to give you something to do. You’re like a secretary on Mad Men who has to drop what you're doing anytime you get buzzed on the intercom. Or think of email as a doorbell that anyone can ring. Imagine how little work you’d get done if the neighbor kids rang your doorbell every five minutes ... all day, every day. Time is the only thing you have every day in which to do your work. When you let email steal your time, you’re leaving the vault doors open and inviting 100,000,000 strangers into the bank. You’re not just letting people steal from you -- you're an accessory to the crime. If email is your public to-do list, that makes it Public Enemy #1 in your work (and life). What's On Your Not To-Do List? We're 17 days into 2012 -- how are those New Year's Resolutions coming? Before you yell at me, hold on. I'm just the messenger. If you’re like most people, you’re working on a list of resolutions: Eat healthy. Go to the gym more. Read the classics. But Peter Drucker would have likely asked you for a different kind of list: What are you going to stop doing? As we’ve noted before, Drucker believed that “planned abandonment” is among the most important things that any organization can engage in. After all, shedding yesterday’s products, programs and policies is the only way to make room for the innovations of tomorrow. But Drucker was also adamant that this same discipline should extend beyond the organization to the individual. That’s the only way one can ensure that he or she maintains proper focus and protects what for many of us is the most precious resource of all: our time. So, what are you going to stop doing this year, to free up more time for high-value activities like 80/20 Marketing? Chime in on the comments section if you'd like to share what's on your Not To-Do List this year. You can learn a lot about how to break bad news to clients (or anyone) from the U.S. Postal Service. Look at the headline -- prices aren't going up, they're "adjusting." A "penny increase" sounds minimal, doesn't it? The increase is softened by bracketing it with the fact that it's the "first since May 2009." 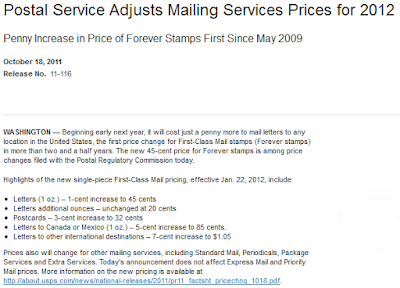 The first paragraph provides more softening context: "... it will cost just a penny more to mail letters to any location in the United States, the first price change ... in more than two and a half years." Sheesh. 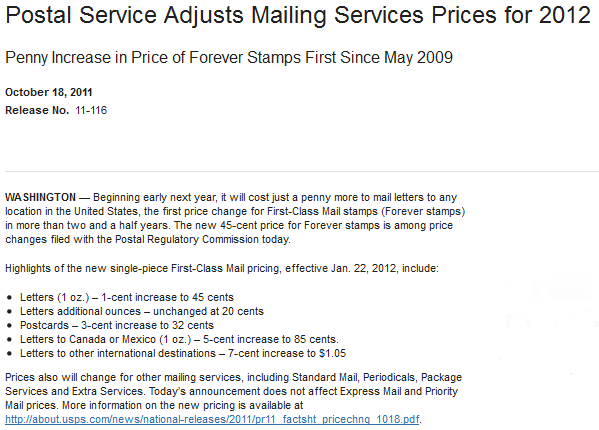 When you phrase it like that, I almost hate to complain about another jump in the price of stamps. Bottom line: this news release -- obviously written by a pro -- illustrates the importance of context and language when communicating bad news to clients (or anyone). ... because, while Bob the mailman or Dolores the postal clerk are pros at what they do and can tell you all about the new prices, they are NOT pros at choosing exactly the right words for this marketing message. What Can Only You Do? What Should You Do Right Now? Twitter asks, "What are you doing?" Success asks, "What should you be doing?" "The higher up you get in an organization, the more you need to focus on what the company needs from you, not on what you want to do." Stop. Look at what you're doing now. Then look at your calendar for the rest of today. How much of what you're doing is what you want to do vs. what your company needs you to do? Especially if you're an entrepreneur or business leader, you need to do what you need to do, not what you want to do. To the extent that those two ideas converge -- you love doing what you need to do -- you win. To the extent that they diverge ... you lose. "While management experts advise doing what you are best at, great leaders do those things that only they can do"
"Figure out what functions only you can perform. These may be tasks that are unique to your role, such as meeting with a key client or calling a top official. Or they may be strengths that the organization lacks, such as solid marketing skills. Gauge how you can be most useful and focus your time and effort there. Then delegate the rest." To figure out what functions only you should perform, here's advice from Tom Hopkins, who uses this as one of his guiding principles: "I must do the most productive thing possible at every given moment." So, here's the question you need to answer, all day every day: What is the most productive thing that only you can do right now? Want to improve your marketing in 2016 -- and beyond? Fact: You can't improve what you don't measure. Problem: You, like all mammals, probably hate tracking the data that goes into marketing. So you don't measure your marketing. Which makes it difficult to improve. Solution: Why not try my Marketing Dashboard? ... so you can do more of what makes you money, and less of what doesn't. Also: it's FREE. Gratis. No cost. First column = days and dates. Duh. Connects Offered/Given = the number of networking connections I offered to or actually made for clients and prospects each day. There's no easier way to start a sales conversation with a prospect than to offer them a networking connection. Pro. Emails = emails sent to prospects, either in reply to inquiries from them (reactive) or to follow up and provide more reasons to like and buy from me (proactive). Pro. Convos. = conversations by phone or in person with prospects. Client Convos. = conversations by phone or in person with clients. Quotes Sent = price quotes sent by email to prospects, after we have had a sales conversation by phone or in person. YES Rec'd = prospects who said yes, they want to buy. Pymt Rec'd = checks or credit card orders received that day. (10 of 10 = good ... 3 of 5 = bad). I filled out the first week of January for you on the example, and left the next week blank for you to insert your own quotas. And, of course, feel free to modify any or all parts to suit your needs. Want to download your free copy? No opt-in or anything -- just click here. One more thing: If you own a business, there's a box of 11 Marketing Multipliers waiting to be shipped to you. You can try it Free. Click here now. Jim Ericson is someone you need to know. Jim Ericson: Hi! My name is Jim Ericson and in the last few months, I met Kevin Donlin who, if I were still doing the Masters Forum, would certainly be one of the speakers I would invite to speak. I would like to talk to Kevin today because he has done something new with an old concept. There is nothing really new in the world; there are just things that are old and important that we need to pay attention to. This one is called Pareto’s Law but Kevin calls it the 80/20 Rule. He applies it to marketing and I think he does it brilliantly. Kevin Donlin: Jim thanks for that nice introduction. Jim: What is the 80/20 Rule? Kevin: The 80/20 Rule, well, I think most of us in business have heard of the 80/20 Rule, it is also called the Pareto Principle. Few of us have really done much with it but it holds such incredible promise that I have been, frankly, obsessed by it for about seven years now. If we do a simple definition of the 80/20 Rule, it would be this: about 20% of input accounts for 80% of output. State it the other way around, about 80% of results can be traced to about 20% of causes. Jim: So a lot of time gets wasted? Jim: 80% of the time that produces 20% of the results could probably be better spent. Kevin: Yeah, by definition it could be. We are surrounded by things that waste our time and effort and energy. In 1906, the Italian economist Vilfredo Pareto observed that 80% of the land in Italy was owned by 20% of the population. He didn’t name the principle after himself, however. It was first popularized by Joseph Juran, the quality expert. He wrote a book called The Quality Control Handbook in 1951. Juran used the Pareto Principle to identify the vital few causes of most defects in manufacturing. Then in the 1960s, software developers began calling it the 80/20 Rule to describe how 80% of engineering deals with 20% of user requirements. 80% of crashes are caused by 20% of bugs, etc. So it has been around for a long time and as you said earlier, we are actually wasting a lot of time and effort without knowing it. The 80/20 Rule kind of pervades life economics, manufacturing, it is all over the place. Kevin: It is not a matter of if we like it or don’t like it, it’s like gravity, you can choose to disagree with gravity but you won’t get far in life. This is just one of those natural laws out there. You can confirm it by looking around your life -- 20% of the carpet in your house gets 80% of the foot traffic, for example ... 20% of your friends and family account for about 80% of your phone minutes. And if you go shopping at Target, about 20% of the items in your shopping cart will add up to about 80% of the bill; it doesn’t matter if you are male or female. The list goes on and on. Jim: How about 20% of your kids cause 80% of your problems? Kevin: Oh yeah. Or family members in general, 80% of the fights are with 20% of your family members. Let me redefine this a bit, it does not always add up to 100 and it is not always 80/20, that is just a general rule of thumb. It could be 5% of your family members cause 98% of your headaches. It could be 72-17. The numbers are always unbalanced, that is the key and they are almost always in a ratio of about 80 to 20. Here is what is interesting -- I have been doing marketing since 1996. Because business and marketing are part of life in our world, business and marketing are predictably unbalanced as well. If you look around your business, 20% of your clients will deliver 80% of your profits. 20% of your products or services will do the same thing and about 20% of your marketing methods will produce 80% of your profits. We may have been introduced to this in one way or another, but what is going to be new to most, if not all, people is that these 80/20 relationships are hidden from view. They are not immediately obvious, by definition. After all, if it were clear to you today that 80% of your profits were coming from 20% of your clients and you knew exactly who those clients were and exactly what you were doing that made them so profitable, you would be doing more of it right now. You would hang up on the other 80% of your clients and start calling and surrounding with love the 20% of the clients that were making the lion share of your profits. These things are hidden and you have to look for them. Kevin: Sure. Or 20% of their fans are buying 80% of their downloads. It is all over the place. Kevin: The goal of 80/20 Marketing is to generate the most profit from the least amount of time, effort and money. You achieve this by doing more of what is highly profitable and the time you now waste doing what isn’t. When you make this mental shift, you are making what amounts to the world’s best and safest investment. Here’s why: If the vital 20% of your marketing efforts produces 80% of the results, that is a four times output, let’s say 4X. Now if the trivial 80% of your marketing produces 20% of your results, which is a one fourth output or 1/4X. As a result, when you do the math, your vital 20% is 16 times more powerful than your trivial 80%. You simply do more of what is highly profitable in the time you now waste doing what isn’t. It is like trading dimes for dollars, day in and day out. Jim: That is kind of what happens, isn’t it? Isn’t it harder to figure out what is the 20% and what is the 80%? You have got to figure that out before you can stop doing the stuff that wastes your time, energy, and money. Kevin: Exactly. An initial reaction that I get from some people is, “Well, wait a minute, if I am going to be focusing more on what I am already doing, am I going to cut myself off from new ideas and am I going to restrict myself?” The answer is, no. Remember, what Steve Jobs said? Saying no to a thousand things is a prerequisite for innovation. Jim: He also said, “Innovation is simply connecting things.” To connect things you have to look outside at the world for very different points of view. If you can free up some time to do that, you add to your potential to be innovative and not subtract from it. Kevin: Let me give you an idea and there is not time to go into all of this, but let’s talk about a couple of signs to help people recognize the 20% of their marketing that is really highly profitable. One criterion is this: it's 20% or less of how you are marketing now. That sounds obvious and idiotic, perhaps, but it could be 10%, it could be 15, it could be 25. If a marketing method works so well that it might account for 80% or more of your current revenues and profits, why wouldn’t I be doing more of it? Well, there may be several reasons but one of the most common is you simply take it for granted. Success with this marketing has become expected and you have not been excited or determined enough to push it as far as it can go for some reason or another. It is probably a small amount of what you are doing to market your business and yet it is highly effective and you just have not pushed it as far as it can go. Here is another criterion: a 20% type of marketing produces an unexpected success. This helps emphasize, again, that you want to look for surprise victories in your marketing. You would have probably passed them by otherwise and you would not be able to fully exploit them if you were not looking for unexpected successes. Here is what Yogi Berra has to say on the subject: “You can observe a lot just by watching.” But who really takes time to watch and observe? And here is an example of how this works -- there is a very large and successful tax preparation firm, they get a lot of referrals based on how they treat their clients and these referrals make them a lot of money. First they were getting these referrals accidentally; it was not until the owner started observing the employees who were generating the most referrals that he saw something unexpected. The top employees were walking into the lobby, greeting clients by name, shaking their hands and walking them, very respectfully, back to the office. It turns out that being treated with respect -- even though it cost nothing to do and it wasn’t anything the boss considered essential -- it was a very big deal to these clients, because they were low-income people. They were used to being treated like dirt by other businesses. The company president never considered this as a marketing tactic, but after seeing the same pattern again and again -- because he was looking for it -- he turned this unexpected success into part of his company’s training program and he is doing very well these days. The bottom line is, what you think is important and what your market thinks is important are often completely different things. You want to pay attention to any unexpected successes in your marketing and never dismiss them as lucky breaks or accidents, not when you can systematize and capitalize on them. Jim: I think one important thing to add there is that John le Carre said, “It is very dangerous to view the world from behind a desk.” For that CEO to actually get out from behind his desk, talk to people, and figure it out, is a very important part of that equation. Kevin: Exactly. You have got to be sleuthing around and looking for unexpected successes. There is no shortcut in Excel or QuickBooks that I know that looks for unexpected successes. It takes a little brain work, but it is definitely worth it. Jim: Cool. So, what from here? How are you going to implement this? Are you in the process of bringing this to the market place? Are you starting to work with some people on helping them with this? It sounds like there’s a pot of gold sitting at the end of a rainbow here for some people if they would just start to pay attention and you probably have got the key. Kevin: I am not offering a magic elixir and I am not promising the world to people. It was about six or seven years ago that I really got into this, when I added it up it was a $2.1 million windfall from one of my businesses simply by following these ideas and going very deep. That counts for something I suppose. Going very deep in and doing more of what worked and less of what didn’t. Again, it is simple in theory but not easy. It wasn’t easy because I had to do a lot of thinking and looking for things but I have managed to put together a list of signs to look for. I did a pilot session about a month ago with very good results with some people who run their own business. I am excited about this because when you are engaged in 80/20 Marketing, it's like sculpting for fun and money. Michelangelo said, and I'm paraphrasing, "in every block of marble I see a perfect statue. My job is to simply chip away the walls that imprison my vision." With 80/20 Marketing, you do the same thing, only what's revealed are profits. In your business, no matter what you do, you are surrounded by 4/5 of what is not your vision, not your ideal result. Simply chip away at those ugly parts of your marketing and you can reveal some seriously beautiful profits hidden inside. Jim: A lot of people try to make things so complicated. Kevin: You can do a lot with three chords and the truth. It is a simple formula but there are an infinite number of applications. If you want to join my next 80/20 Marketing "UnCoaching" program, you can learn more at www.8020Unlimited.com. It's geared toward entrepreneurs and sales/marketing professionals who want to chip away 4/5 of the crap that's surrounding their business. And if you want to sample the tactics that work best in 80/20 Marketing, I will point you to www.ClientCloningKit.com. That's where you can download a set of six tools, all based on these ideas. It's free to download and there are also a limited number of kits that can be mailed out for free in the continental US. Think of a day when you made a lot of money in your business. Give a seminar in a hotel that produced 23 high-profit sales? Call to follow up on an emailed project quote and make the sale over the phone? Meet 3 referred prospects for coffee in one afternoon and sell two of them? Now that you've identified at least one big-money day in your past, try something radical: Do it again. If your last big payday was a seminar, for example, schedule your next seminar today -- even if you're not ready. Deadlines have a wonderful way of forcing you to take action ... especially if you're paying to rent the room for your seminar. If your last big sale came after making a follow-up phone call, pick up the phone and make a follow-up call today. Better: make 5 calls. If your last big payday came when you sold 2 of 3 prospects over coffee, why not invite both of those new clients meet each other -- and ask them to bring a friend? And re-invite that prospect you didn't sell before? You get the idea. Stop trying to reinvent the wheel, at least for today. Cloning your best efforts is one way to clone your best clients.